This optional feature provides operators with the ability to monitor and alter grades while also providing information regarding specific applications. 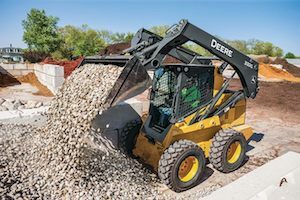 In an effort to cater to customers working on job sites that involve leveling and slope work, John Deere has announced a new on-board grade indication option for its machines. This option is available on large-frame G-Series skid steers and large-frame G-Series compact track loaders. The industry-exclusive on-board grade indication option provides users with an accurate read of the cross slope and main-fall slope of their machine. In addition, the readout can be easily configured to display either percentage or degrees, depending on operator preference. "Our industry-exclusive on-board grade indication was designed to be an indispensable unit for applications like water drainage, general site prep and clearing work, allowing operators to accurately monitor and alter grades from the seat of the cab," said Gregg Zupancic, product marketing manager, skid steers and compact track loaders, John Deere Construction & Forestry. "This feature is intuitive and easy to use so operators can take advantage of this technology without specialized training." Operators can receive beneficial information regarding specific applications with absolute and relative slope readouts. With the absolute value readout, operators have information during general grading applications that do not need a local grade reference. The relative value readout is useful to customers looking to alter grade relative to an existing or reference grade. More information on the new on-board grade indication option, G-Series skid steers, and G-Series compact track loaders can all be found by speaking to your local John Deere dealer or visiting www.JohnDeere.com.